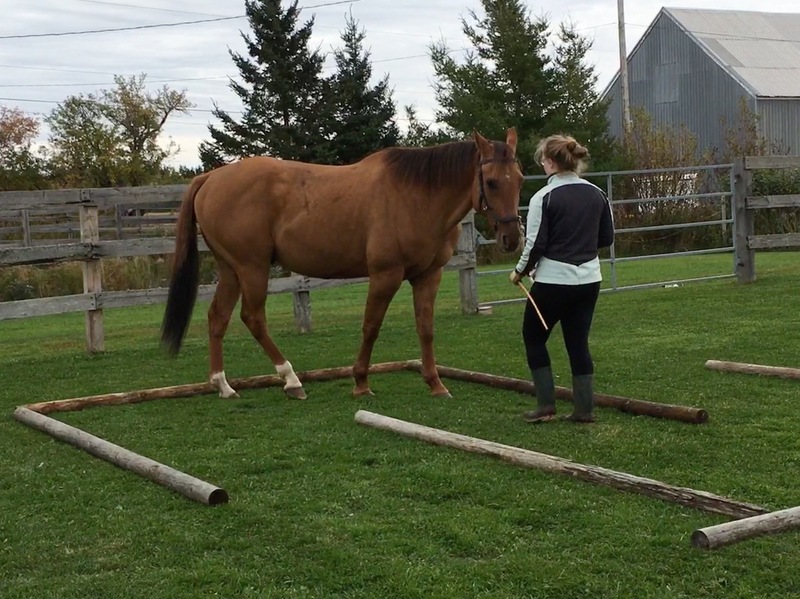 “If you are having trouble with something, try doing it one step at a time,” I said to my barn helper whose horse was staying with us for a little while. Evangelinia and her handsome red dun Charmer have a very special bond and together we have been helping him feel better in his body and mind. So, mostly walking for a while! I had set up a small labyrinth a la Linda Tellington-Jones which is a great opportunity to practice bending, responsiveness, and mindfulness. That day I had run out of time to give my young mare Maybelle a full session. 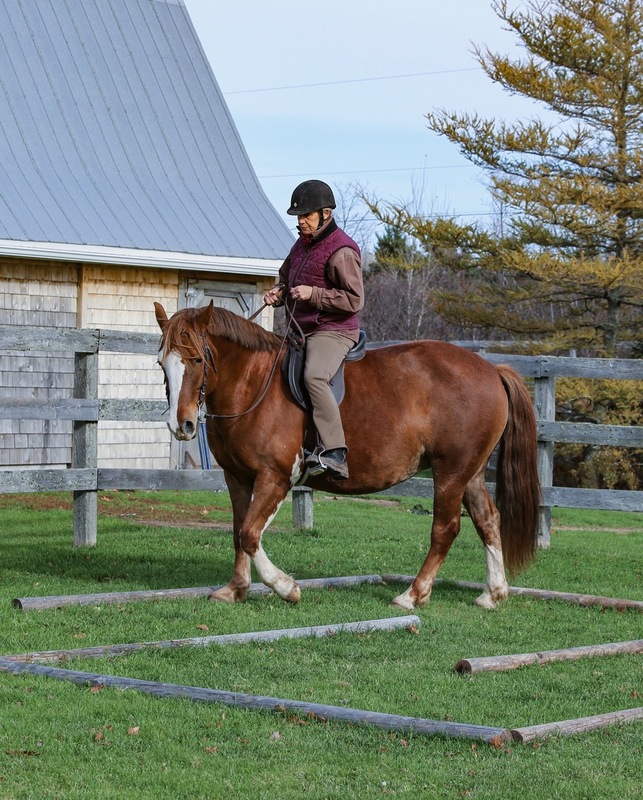 Instead, I formed the intention to have a teeny tiny session in the short distance between her stall and turn out – about 25 feet down the barn aisle. Not sure exactly what I would do, I opened her stall guard inward to put the halter on. I had with me a short bamboo stick to extend the reach of my touch. I left the door open as I put the halter on, explaining as needed (which isn’t much, just one or two touches on her chest with the bamboo) that she was not to push through me to leave the stall. Excellent! Good girl! One step, pause. One step, pause. One step, pause. In those dozen steps she learned to wait for my request and keep her weight balanced over her feet! Good girl! That is so beautiful! My request was two fingers on the noseband of her halter lightly inviting her forward. The only correction a delicate touch on her chest with the bamboo. By the last four steps my request was almost imperceptible and no correction was needed. She was with me and listening. Beautiful! Thank you! Pause for a rub of appreciation and then out you go. Incidental groundwork. Isn’t that a great expression?! Mark Rashid used it in his book, Finding the Missed Path, that I was reading recently. It is a reminder that every moment we are interacting with our horses is an opportunity to help us both learn to communicate. Maybelle turns five in 2019 and has had mindful handling her whole life. As her formal training begins, I can feel how much she already knows about how to be with humans. Her “incidental groundwork” has been delicate and precise. She wants to be connected because connection feels good! A lot of horses – and people for that matter! – find it really difficult to take one step at a time. Using momentum is easier in a way, but not really in the long run. What happens when I need to stop abruptly or change direction?! Moving with mindfulness and attention, with weight balanced over my feet, I am poised for anything. Charmer and Evangelinia were having some trouble in the labyrinth when I suggested, “One step at a time.” One step, pause, think. Horse and human! As I watched, they slowed down and worked together to sort out how to move their bodies through the labyrinth. Evangelinia helped Charmer find balanced and elegant steps to navigate the tight turns. In doing so she was discovering another means to guide her friend in his journey to feel better in his body and mind.